Don’t forget to enter my One Year Blogiversary Giveaway! The giveaway will end tonight at midnight CST. Click here to leave a comment on the giveaway post and be entered to win a free Craftsy class of your choice!!! 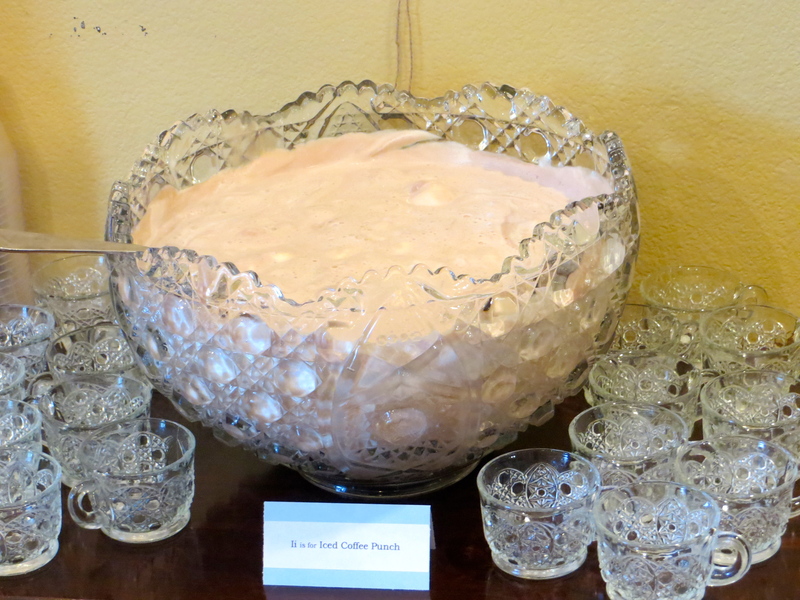 I’ve been making this punch for almost 10 years and it is a favorite at baby/bridal showers and family gatherings. It is cold, creamy, sweet, and has a hint of coffee. I don’t like coffee but I can drink this punch all day long. There’s ice cream floating in it. Need I say more? In a large glass measuring cup combine the water and sugar. Heat on high in the microwave in 60 second intervals until all the sugar has completely dissolved. Stir in the instant coffee and set aside to cool to room temperature. At this point you can refrigerate the coffee syrup for later use if you are prepping for a party. Pour the coffee syrup into a large punch bowl. Stir in the milk. Scoop in the vanilla and chocolate ice cream then stir to combine. Continue to stir occasionally as the ice cream will start to melt into the punch. YUM!!! Don’t forget to enter my One Year Blogiversary Giveaway! The giveaway will end Thursday, January 31 at midnight CST. Click here to leave a comment on the giveaway post and be entered to win a free Craftsy class of your choice!!! This dip is warm and creamy and satisfying like spinach dip usually is but it has the added tang of goat cheese, one of my favorite flavors. It is also enhanced by the addition of fresh herbs and roasted garlic. 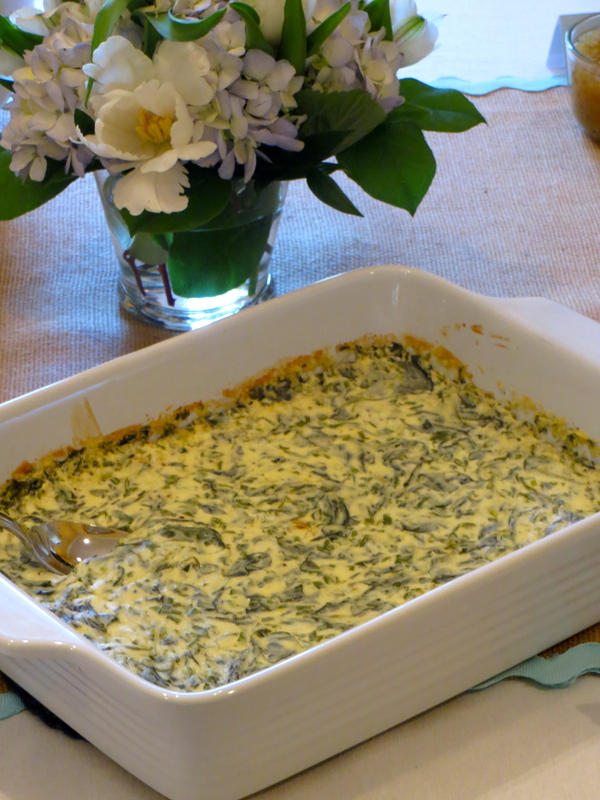 Finally, using fresh spinach instead of frozen sets this dip apart, as it keeps the spinach from being a mushy mesh and less likely to make your dip watery (in my opinion). Preheat oven to 350 degrees F. Slice off top 1/4 of head of garlic. Drizzle with olive oil and sprinkle with 1/4 teaspoon salt. Wrap in foil and roast in oven for 1 hour. Let stand until cool enough to handle then squeeze garlic from skin, reserving garlic and discarding skin. While the garlic is roasting, bring a large stockpot of water to a boil. Place a large bowl of ice water next to the stove. Have a strainer with a handle ready. Put an entire large bag of spinach leaves into the boiling water and stir to immerse all of them. You may not think they will all fit but they will if you give it a stir. After 30 seconds, remove the spinach with the strainer and immediately immerse it in the ice water bath. Once the spinach is completely cool, remove from the ice water and squeeze the excess water out. Place the spinach in a clean kitchen towel and continue to squeeze until very dry. The more water you get out of your spinach at this stage, the less likely you will be to have runny dip later. Measure out 3/4 cup of spinach and chop it with a knife a few times to break up the leaves. In a mixing bowl, combine the mayonnaise, sour cream, and goat cheese, and beat with an electric mixer until well blended. Stir in roasted garlic, parsley, chives, tarragon, and garlic powder. Stir in spinach. Add salt and pepper to taste. Spread into shallow baking dish and bake at 350F for 25 to 30 minutes, or until starting to bubble around the edges. Serve with tortilla chips or toasted baguette slices. This Hollyburn skirt is my most recently finished sewing project and I have to tell you what a joy it was to stitch up. I was in the middle of muslining the shirtwaist dress from Gertie’s New Book for Better Sewing because I’m going to a workshop in California with Gertie (!!!) next weekend. I needed something quick and easy with no fitting issues to cleanse my sewing palate and this skirt was just the thing. Simply make sure you pick the right waist measurement, confirm with the finished garment measurement and start cutting and sewing. I chose a poly blend suiting from my stash (from Joann’s) and used a silky royal blue cotton sateen for the pocket and waistband lining (from the NYC trip). The interesting thing about the fabric from Joann’s is that I have a pair of pants from The Limited in the exact same fabric! I was originally going to participate in the Hollyburn Sewalong being hosted by Rachel at My Messings but once I got started on this pattern I couldn’t wait to finish it up. I have come to the conclusion that Tasia of Sewaholic Patterns is a very gifted pattern designer/drafter. I have now made 3 of her patterns (Renfrew x 2, Cambie, and this skirt),and they are all very well-drafted and the instructions, while succinct, are very well-written. This skirt is a simple half circle with slash pockets, center back zipper, and three length variations. I chose to make the shortest version as I recently read that my ideal skirt length is a little above my knee — never knew I had short shins! I made a size 8 but I did cut the length at the size 16 line. I sewed a 5/8″ hem. While this pattern is suitable for beginning sewers, I decided to make a few small modifications to fancy it up a bit. I split the pocket piece into two to create a separate pocket lining piece. I also sewed the skirt/pocket lining seam at 1/2″ so that the apparel fabric would roll to the inside a little bit and the blue wouldn’t be visible from the outside of the garment. Until the Date Night Dress, I have only ever done invisible zippers. This skirt was my first time doing a centered zipper. I probably ripped and basted this thing a half-dozen times before I was satisfied. I finally got it close and steamed the life out of it to make it look decent. I have to say I am quite satisfied with it now. I departed from the directions as written a bit and sewed the back seam up to the notches and backstitched. Then, I basted the rest of the seam closed to make pressing the seam allowances back easier. I took the basting out after pressing and before pinning the zipper but I think if I had left the basting in while pinning, I wouldn’t have had to rip the zipper out so many times. Any more experienced zipper-installers have a say about this? Here’s how I wore it to work. 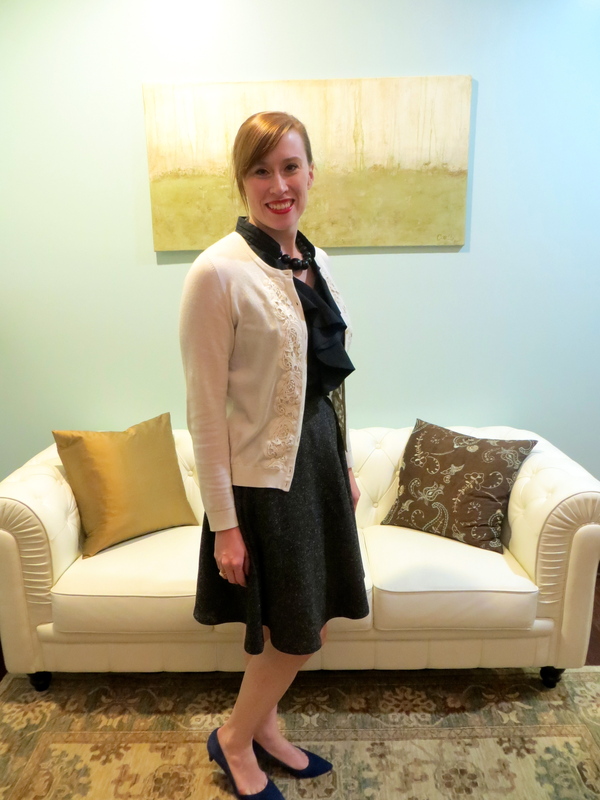 Same old Talbots cardigan (I love this thing! ), and my Via Spiga pointy-toe, low-heel pumps. You can’t really see it in the photos but they are blue suede that matches the lining fabric. 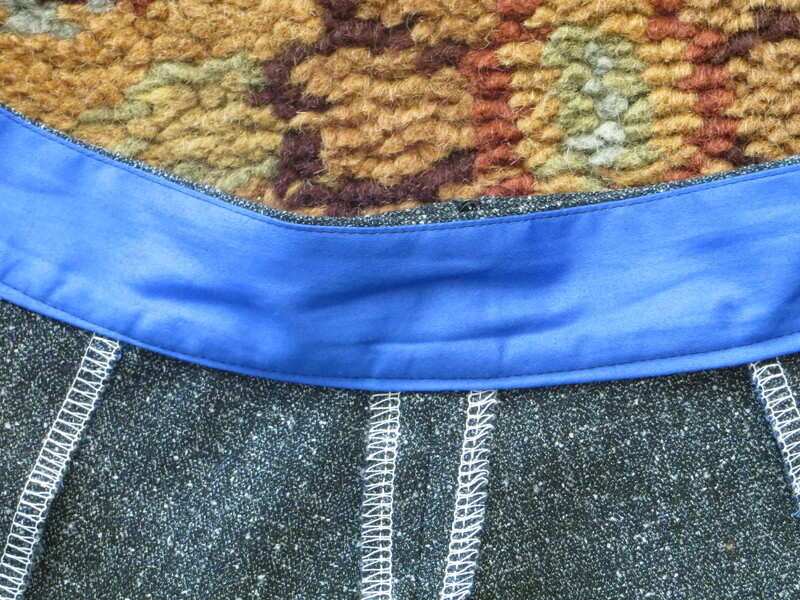 I also modified the waistband piece to be able to line it with my blue fabric. I split the waistband piece in half lengthwise, then added a 5/8″ seam allowance. 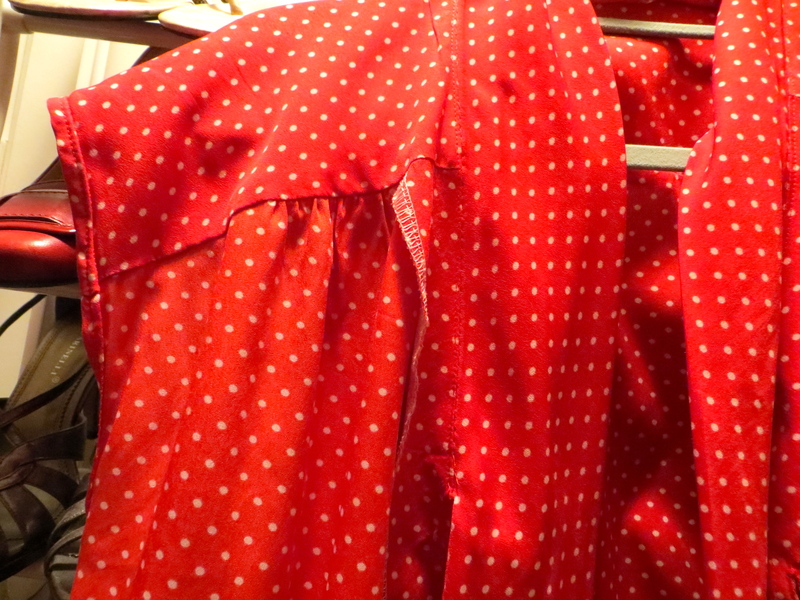 I then cut one piece each from fashion and lining fabric. 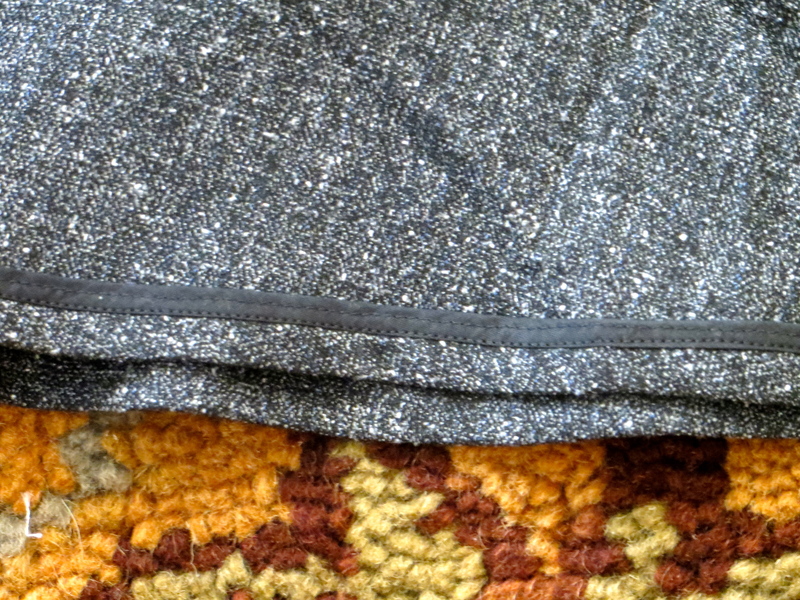 I interfaced the fashion fabric only with a lightweight woven interfacing from Emma One Sock. I sewed the pieces together along one long edge, trimmed and edgestitched, then treated the pieces as one per the instructions for the remainder of the construction process. I finished all my raw edges with my serger. I guess I could’ve changed to black thread but I kind of like the white contrast since the fabric has little white flecks in it. To finish the waistband, I stitched in the ditch all the way around and this worked out perfectly. Don’t forget to enter my One Year Blogiversary Giveaway! The giveaway will end Thursday, January 31 at midnight CST. Click here to enter a comment on the giveaway post and be entered to win a free Craftsy class of your choice!!! In my office at work. This is a finished object that has been hanging in my closet for quite a few months now (since the summer). Sorry it has taken me so long to get some decent pictures of it. This blouse is the Belle Bow Blouse by In House Patterns, an indie pattern company that was new to me until I came across their downloadable offerings on Pattern Review. The blouse features a neck tie, button front, waist tucks in front and back for shaping, and gathers at the shoulder yoke with sleeveless dropped shoulders. I must say I am very impressed with In House Patterns so far. This pattern was very well-drafted, the instructions are excellent and create a very clean, professional finish, and the seam allowances are already reduced to keep you from having to trim everything. To top it all off, these patterns are drafted for a D-cup so I didn’t have to spend time doing a full bust adjustment (FBA). I can tell you from personal experience that the top fits very true to the size chart without excess ease. I was one size bigger in the hips than the waist and bust but I thought it wouldn’t be a big deal so I didn’t grade up. Mistake — I ended up having to let my tucks out a little bit to accommodate my hips. Next time I will know to go ahead and grade out at the side seams. I made the shirt from a cheap polyester that I picked up at the Vogue Fabrics booth at the Sewing Expo in Atlanta last year. It took right at 1.5 yards. It gets staticky like crazy. I used tricot fusible for the button placket. I used the buttons I picked up in England for the closures. A view of the inside. As far as the finishes called for, the facing edges are serged. The front bodice/yoke seam is clean finished so no exposed edges show. The back yoke seam is finished with the serger. The side seam edges call for a serged finish. The sleeves and bottom have a narrow machine hem. Front yoke seam — inside view. All in all, I can’t recommend this pattern enough. If you haven’t seen In House Patterns before, go check them out. And if you’re concerned because you aren’t a D bust cup, Alexandra has a lot of great information on her website about how to alter her patterns for larger and smaller sizes. I am looking forward to new patterns from this great designer! As I mentioned yesterday, I am celebrating one year of blogging about my cooking and sewing adventures. I am amazed that I have accomplished all that I have — I have baked fancy cakes, perfected roasted chicken, whipped up some tasty cocktails, made some cute tops, conquered a princess seam sloper, and sewed a boutique-worthy dress. I have also enjoyed “meeting” other bloggers, helping me broaden my sewing skills and exposing me to things I may not have otherwise come across. In the coming weeks/months, I hope to share with you all the finished projects that have been hanging in my closet for a while now as well as the ones that are just getting finished up. My life is pretty hectic, so finding time to sew is hard enough, but finding time to get good photos and blog about them is even harder. I hope with longer days ahead, this will not be as much of an issue. Right now I have about 6 unblogged garments to show you. Perhaps I will aim to present 1 every two weeks? In the kitchen, Mr. Homemaker and I have recently subscribed to an organic produce delivery service and receive a box every other week. So far we have been very pleased and find ourselves eating at home a lot more often. I will try to share more recipes with you that involve fresh produce from our box as well as go through some of my entertaining essentials. Well, enough of that. Now for the giveaway I mentioned yesterday. I am giving away, compliments of me, a gift certificate for a free Craftsy class to one lucky reader. All you have to do is comment on this post and tell me which of my posts in the past year has been your favorite and what you would like to see me post in the upcoming year. This giveaway is open to readers anywhere in the world (the prize will be provided via e-mail). If you aren’t familiar with Craftsy, it is an online learning platform that provides video courses for many different crafts (baking, cake decorating, sewing, knitting, jewelry making, gardening, etc.). You can watch the classes at your convenience and on your own time and they never expire. Even if you don’t win, they offer several free mini classes, so it’s worth checking out. Please note, this giveaway is not being sponsored by Craftsy. I am purchasing this prize myself to celebrate my one year Blogiversary. Yay!!! The giveaway will close next Thursday, January 31, and I will announce the winner shortly thereafter. Good luck and thanks for reading! 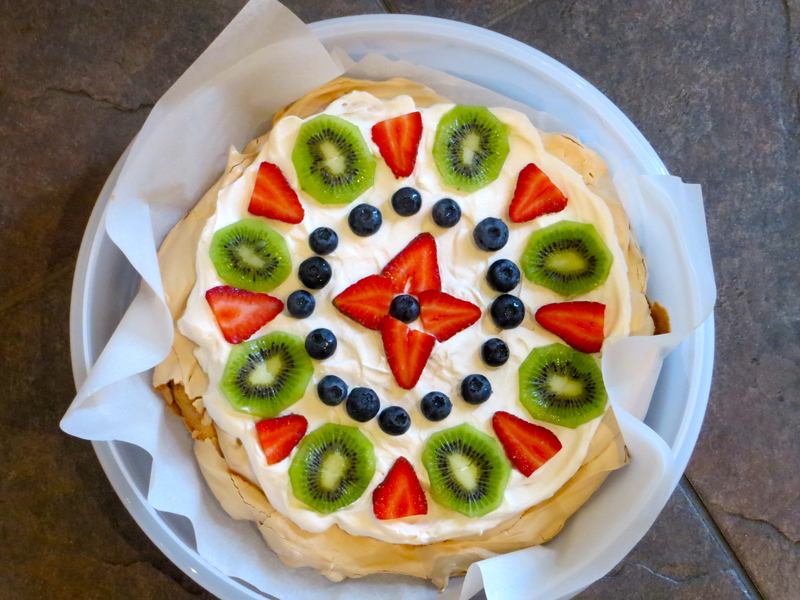 Perfectly Easy Pavlova and a Blogiversary! How many of you sewers out there were thinking I had gotten my hands on a copy of Cake Pattern’s newest release, the Pavlova wrap top and skirt, before it officially hits the market? Sorry, no such luck. 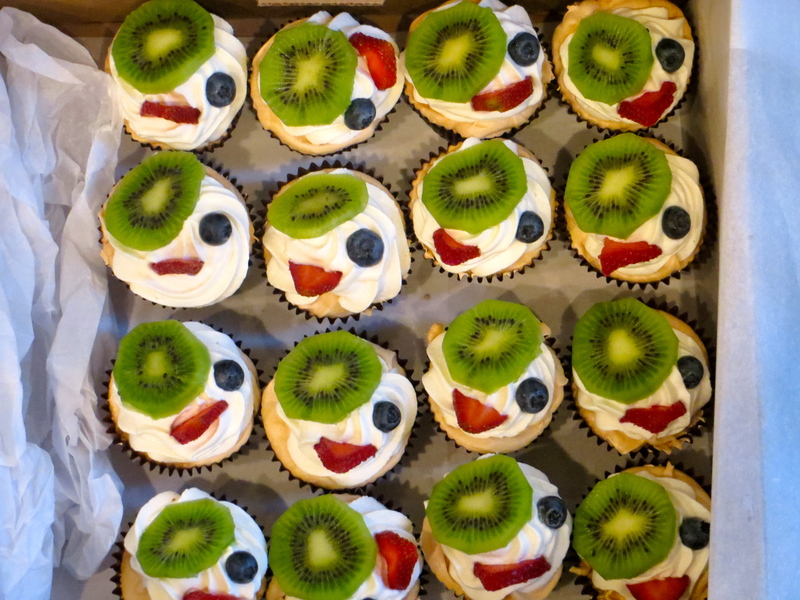 But I did make you this tasty edible version of the Australian dessert that starts with a light meringue shell, gets filled with airy, sweetened whipped cream, and then topped with your choice of seasonal fresh fruits. I even made some mini ones to share. Do you think they look like funny little faces? This recipe looks complicated but it is as simple as can be. My sister first introduced me to it several years ago and we have been making it regularly since. If you have a few basic ingredients and an electric mixer, you can wow your friends and loved ones with this sure-to-please confection. I have used strawberries, kiwi, and blueberries here because they happened to come in my produce box for the week, but you can use your favorite complimenting fruits — peaches, nectarines, raspberries, blackberries, etc. So, first you are going to beat your room temperature egg whites until they are stiff and glossy like so. Can you see my reflection in these? The bottom row has been smoothed. 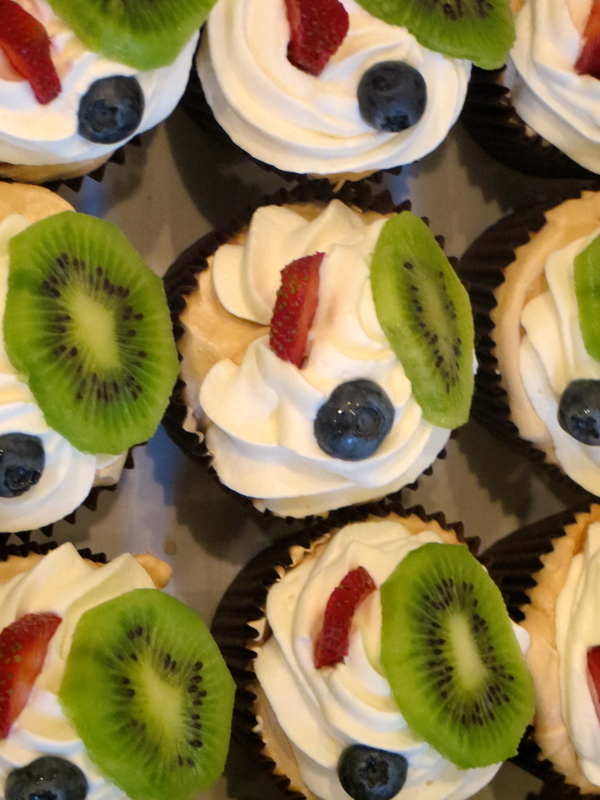 If you choose to make the cupcakes, one batch makes about 2 dozen regular size cupcakes. This time around I just used a spoon to fill the paper cups then smoothed the tops with a wet metal tablespoon (this is a great kitchen trick for meringue). 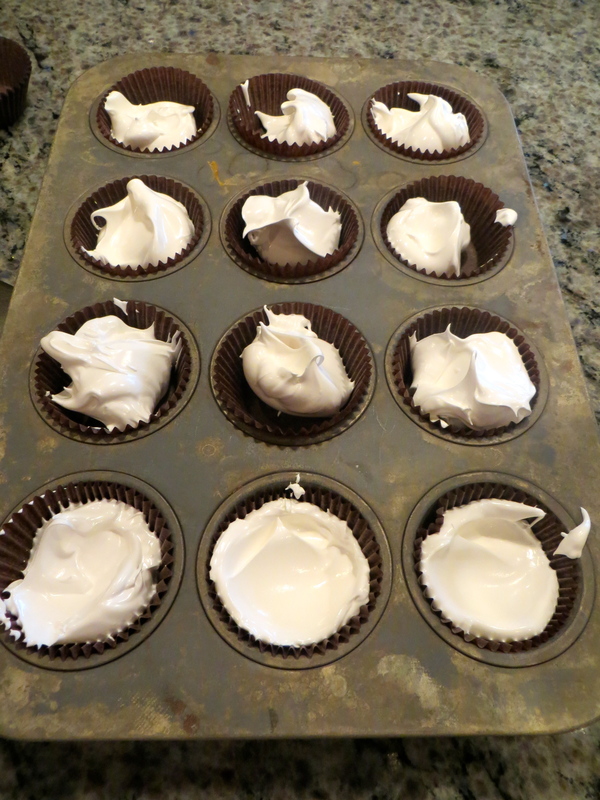 If I am being fancy, I will use my piping tools to make mini meringue nests on parchment and forego the cupcake papers and tin. For the large pie, trace a 9″ circle onto parchment paper, flip the paper over and place it on a baking tray, then spread the meringue on top. Use the spoon to spread it into the circle and smooth the top with the wet spoon. I spooned the whipped cream on top for the full-size Pavlova, but for the mini ones I piped the whipped cream on with a pastry bag and large closed star tip. 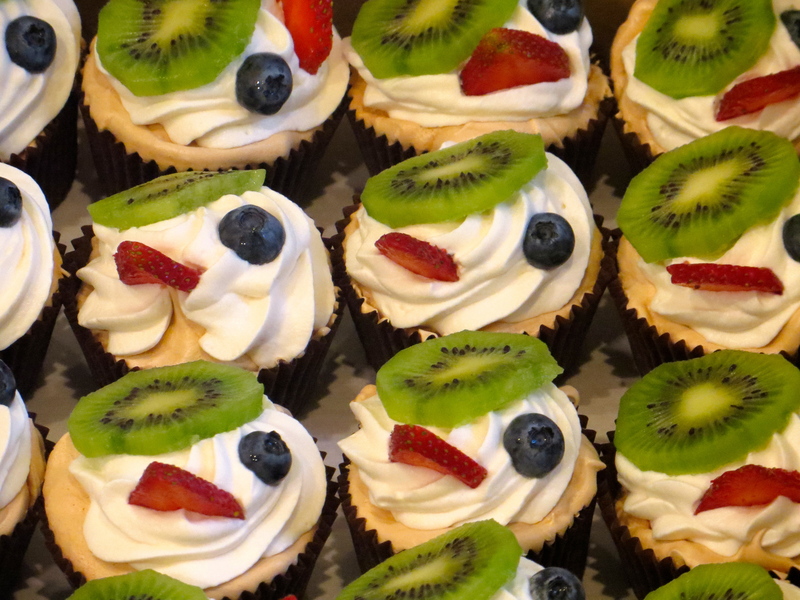 As for the fruit, you can make it as decorative (or not) as you would like. It will taste great either way! In a mixer fitted with a whisk attachment (or using a hand mixer), whip the egg whites, cream of tartar and salt in a clean, dry bowl until foamy. Add the granulated sugar, cornstarch, vinegar, and vanilla and continue whipping until stiff, smooth and glossy, about 8 minutes more. On a sheet of parchment paper cut to fit a sheet pan, use a pencil to draw or trace a circle 9-inches in diameter. Line the sheet pan with the parchment, pencil side down (you should still be able to see the circle). Spoon the egg whites into the circle, using the back of the spoon to smooth the top and sides of the disk (use a wet spoon for best results). Bake in the center of the oven for 10 minutes, then reduce the heat to 300 degrees and bake until the meringue has puffed up and cracked on the top and the surface is lightly browned to the color of cafe au lait, about 45 minutes more. Turn off the oven, prop the oven door open, and let the Pavlova cool in the oven at least 30 minutes, to room temperature. This ensures a gradual cooling, which protects the delicate meringue. Whip the cream and brown sugar together until stiff. 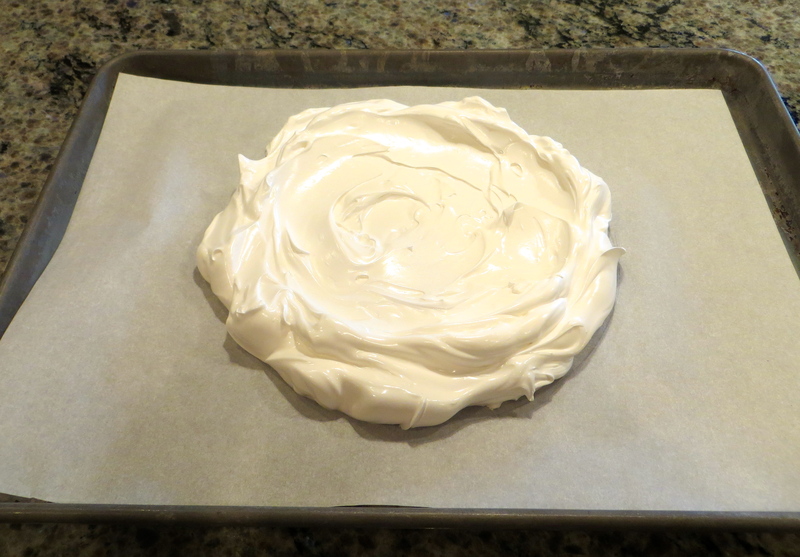 Spoon it in the center of the cooled Pavlova and spread out to within 1/2-inch of the edge. Arrange the slices of kiwi around the edge. Arrange the slices of strawberry in the middle. To serve, slice into wedges with a serrated knife. Recipe by Gale Gand, courtesy of the Food Network. So here it is — my big sewing accomplishment from the New Year’s holiday. I am so pleased with how this make turned out. I didn’t copy a particular RTW design but I do think it looks a lot like some Kate Spade dresses I have seen. What do you think? This dress is made from New Look 6457 and I used one of my NYC fabrics — a luscious silk Dupioni/Shantung with a white background, large grey and black paisleys, and scattered black and dark cobalt/navy sequins. It is trimmed with black satin (self-made) piping at the princess seams, neckline, armholes, waistline, and hem. 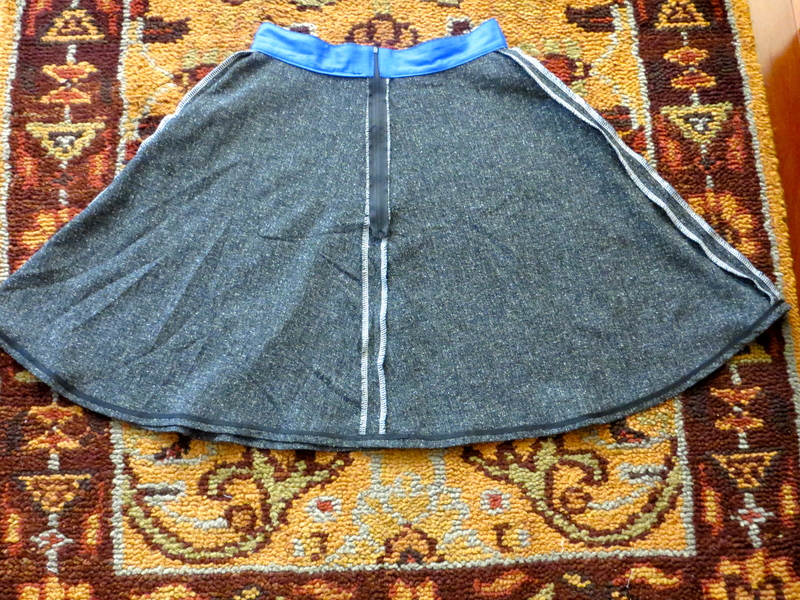 I finished it with a handpicked lapped center back zipper and handstitched invisible hem (with grey lace hem tape). My first lapped and handpicked zipper! As far as alterations go, I used the bodice front pieces from Simplicity 2648 (see Peplum Top from last week) because I knew they already fit. 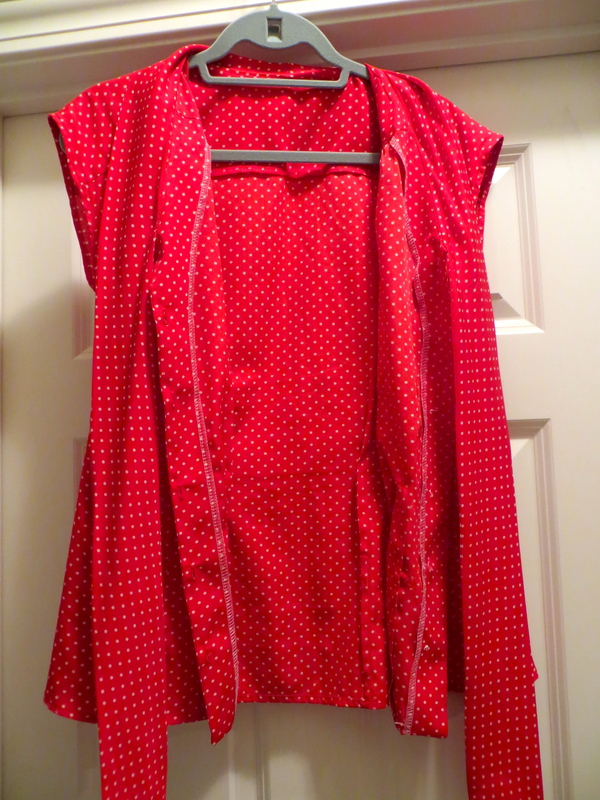 I lowered the front neckline 1.5″ and the back neckline 3″. I took 0.5″ off the bodice length. I added piping to the princess seams because I like the look, although this wasn’t called for in the pattern. The pattern called for a gathered, Dirndl skirt, but I wanted something with a cleaner look, so I cut the pattern skirt pieces but converted the gathers to box pleats in the front and regular pleats in the back and lined them up with the princess seams. I learned several new techniques while making this dress — how to make piping from scratch, how to insert a lapped zipper, how to handpick a zipper, how to insert a zipper guard, how to apply hem tape, how to insert a hook and eye, and how to insert a dress lining without any hand stitching (yay!). I fully lined the dress, the bodice with a stretch satin because it feels so good slipping on and off, and the skirt with Bemberg rayon. I hemmed the skirt lining by machine and frilled it up with grey lace hem tape to match the dress skirt. I applied a zipper guard to keep the zipper from eating up the lining or dress fabric. 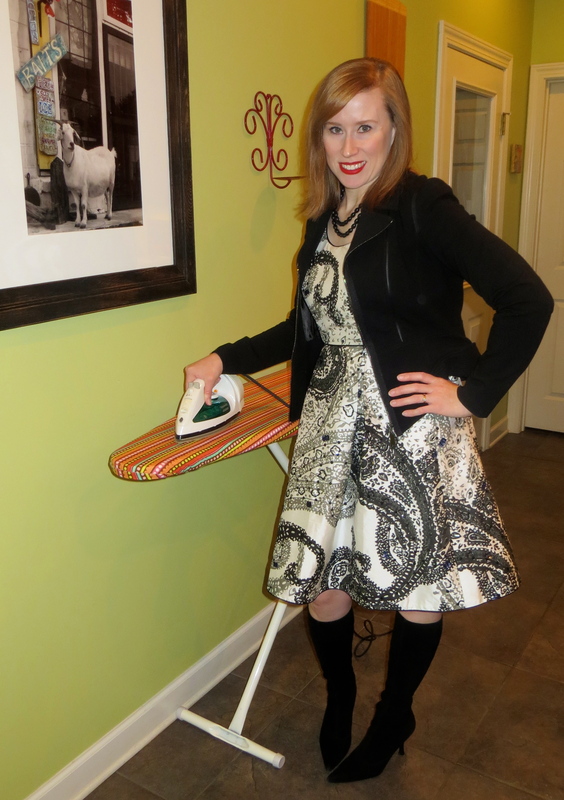 Here is a view of how I wore the dress for its second outing (to church and brunch), plus an action shot of me ironing some invisible fabric. I topped it with a chunkier necklace (The Limited), RTW black ponte jacket with leather trim (Elie Tahari), and black suede tall boots (Stuart Weitzman). And fresh hair and make-up. So while there are a few things that are not perfect about my dress, I will not be pointing those things out to you and I dare you to spot them (well, I don’t really dare you, but you know what I mean). I am so glad I have finally made something substantial I am proud of and will wear over and over again. And because I promised a glimpse of what’s on my sewing table, Gertie’s shirtwaist dress, as a shirt with a peplum (are you tired of those yet?). This is a wearable muslin and if it turns out, I will be making the dress next. What’s on your sewing table?